In this DIY session, we make an Arduino Motor Driver Shield to drive DC motors, stepper motor and Servo Motor. Compatible with Arduino UNO and Arduino Mega, this motor driver shield can operate 4 DC motors or 1 stepper motor and 2 servo motors at a time. Here two L293D Motor Driver ICs are used for driving motors and an 8-bit shift register for controlling them. 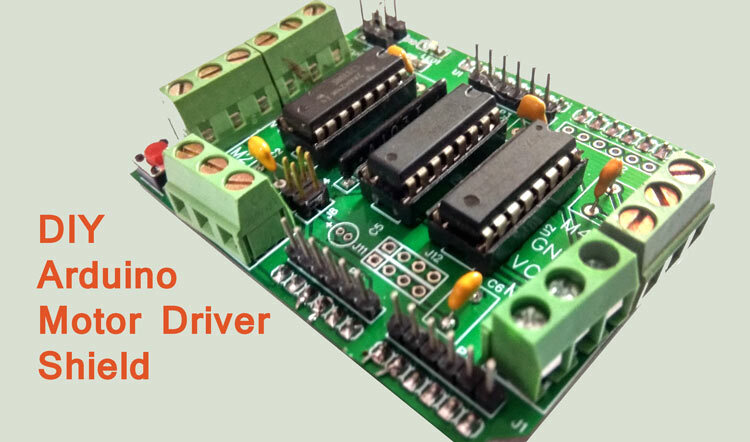 This Arduino motor driver shield can be used to build DC or stepper motor based projects like a Robotic Arm, Line Follower, land robbers, maze followers and many more projects. This board can be controlled by using Arduino like Arduino UNO, Arduino Mega and similar boards. It has screw terminal for conncecting motors wires. L293D motor driver is signaled by using a shift register 74HC595 and the shift register is signaled by using the Arduino. It has jumper pins to select either 12v Power to Motors or 5v power to motors. M1PWM, M2PWM, M3PWM, and M4PWM are used for controlling DC motor speed. If DC motor speed controlling is not necessary make these pins HIGH. SERVO1 and SERVO2 for Servo Motors. With this shield, making motor based projects are super easy with Arduino. You just have to fix the shield over Arduino and control motors using this shield. You can use the given code (in the end) or use your own code for controlling the motors according to your application. To design this Arduino Motor Driver Shield, we have chosen the online EDA tool called EasyEDA. I have previously used EasyEDA many times and found it a great online tool to use since it has a large collection of footprints and it is open-source. After designing the PCB we can order the PCB samples by their low cost PCB fabrication services. Moreover, they also offer component sourcing service where they have a large stock of electronic components and users can order the required components along with the PCB boards. After completing the design of this Arduino Motor Shield, you can order the PCB through JLCPCB.com. To order the PCB from JLCPCB, you need Gerber File. To download Gerber files of your PCB just click the Fabrication Output button in EasyEDA editor page, then download from the EasyEDA PCB order page. After ordering the PCB, you can check the Production Progress of your PCB with date and time. You check it by going on Account page and click on "Production Progress" link under the PCB like, shown in below image. After getting these pieces I have mounted all the required components over the PCB connected it with Arduino for demonstration. So our Arduino Motor Driver Shield is ready, and you can directly use it with Arduino to control many motors at a time. Yes as I see in posted. I need it to DIY for my own.